Speed limit is less than 10 miles an hour. Display your theatre tickets on your dashboard at all times. No re-entry or rain checks. No photography or video of the movie screen is permitted. Park with your front wheel as close to the pole as you can. Two cars must fit between each pole. If you prefer to sit in chairs outside your car, please make certain you sit in front of your car, and not in the adjacent parking space. We do not allow reserving spaces; parking spaces are 1st come 1st serve. Lift gates and rear doors cannot exceed the height of your vehicle. Twine to tie down is available at the refreshment center. Respect your neighbors. Refrain from loud talking during the movie. Absolutely no obscene language while on property. Please seek out a Holiday Auto Theatre team member to report complaints or problems. Use your parking lights when entering or leaving the Holiday Auto Theatre when the movie is running. Please be respectful of other guests by making sure your lights do not interfere with the enjoyment of others. Do not leave your car running during the movie. 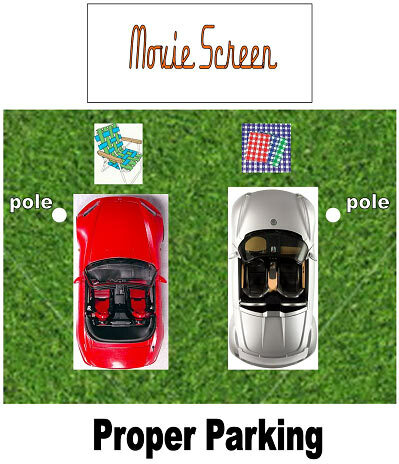 Before leaving, make certain that the area around your car is clear of other movie guests. Remember there may be someone outside your view. Everyone must wear shoes when outside your car. No alcoholic beverages on property at any time. The purchase of a $5 Food Permit is required when bringing outside food into the theatre. With that, you can receive a $2 discount on a purchase of $5 or more at the Refreshment Center. Only available on same-day permit purchase. Gentle dogs on leashes are allowed at the Holiday. Please walk your pet in the grass area on the East side of the property. All �presents� must be picked up by the pet�s owner. Plastic bags can be obtained at the Refreshment Center. Alcoholic beverages are NOT permitted on the premises. Open containers violate Ohio state law. The play area closes when the movie begins. You may not cook, grill or in any way prepare food on the premises. We encourage your entire party to arrive together as reserving spaces is not permitted. The management reserves the right to refuse admission on tickets and to designate where cars may be parked. We assume no liability for accidents while on the premises.